I am lucky enough to have an influx of home grown citrus this time of year! thanks to our lemon tree and my partners mothers, range of Lemon, French Lemon and Lime trees! The ingredients are so minimal and they have such a light flavour – perfect for after dinner or when you need something to stop the sugar cravings. I used minimal sweetener, which is always a winner. Bliss balls are amazing because the flavor options are endless, if there is a flavour combo you would like me to try let me know and comment below! Optional: 1 serving Protein Powder/ Hemp Seeds – for boosted protein! Soak cashews and macadamias for 6 hours. Rinse. Add all ingredients to food processor. Mix gently (on low) until mixture has combined. Separate into balls (approx. 1 tbsp.) 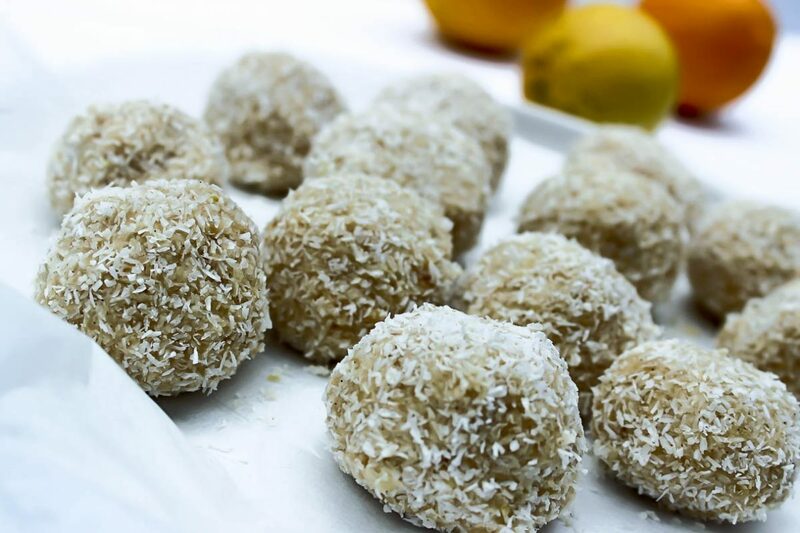 Roll into extra desiccated coconut. Place in fridge for fridge for 2 hours and enjoy. They can be kept in air tight container in the fridge for a week or longer in freezer!